Keywords: yeast, aging, stress resistance, retrograde signaling. Please cite this article as: Maksim I. Sorokin, Dmitry A. Knorre, and Fedor F. Severin (2014). Early manifestations of replicative aging in the yeast Saccharomyces cerevisiae. Microbial Cell 1(1): 37-42. The budding yeast Saccharomyces cerevisiae is an example of a unicellular organism with markedly asymmetrical division: newly emerged daughter cells are normally significantly smaller than the mothers (see ). However, the asymmetry is not limited to the differences in volume: mother-to-daughter transport of a specific set of mRNAs prevents mating type switching by repression of the HO promoter in the daughter cells . Further, it was shown that carbonylated or misfolded proteins and extrachromosomal rDNA circles  are retained in the mother cells. Recently, we showed that such transport is necessary to prevent high stress susceptibility of the daughter cells . At the same time, multiple rounds of asymmetrical divisions result in subsequent decrease in viability in replicatively old cells. As a result, the chance of a spontaneous death of the yeast cell increases with each division cycle after production of approximately 15 buds , . One of the most pronounced consequences of asymmetrical redistribution of cytoplasmic contents appears to be the mitochondrial morphology. In yeast, abnormal morphology of the mitochondrial network and increased reactive oxygen species production can be observed already after 6-8 divisions . The latter is not surprising because the mother/daughter redistribution of mitochondria is not random: the mother cell tends to retain mitochondria with higher superoxide level , while mitochondria with intact aconitase (a Fe-S cluster-containing enzyme that is sensitive to ROS) are preferentially transported to the bud . Here we report a number of changes in cellular physiology (i.e. a decrease in stress resistances) that occur even earlier than 6-8 cell divisions. We also found that the probability of harboring a mitochondrial fragment with significantly different transmembrane potential than in the rest of the mitochondrial network within same cell increases with each cell cycle. These early age-dependent changes might significantly affect the stress resistances of the cells. 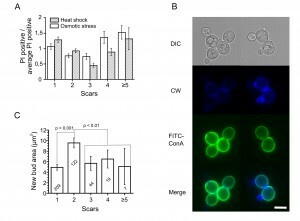 First, to test the age-dependence of stress resistances, exponentially growing yeast cells were subjected to a number of treatments (Table 1) and then stained with propidium iodide (PI) to visualize dead cells and with calcofluor white (CW) to visualize birth and bud scars. Then we counted the scars for each dead and live cell and calculated the percentage of PI positive cells for each aging class, where age = 1 corresponds to virgin daughter cells (with birth scars only), age = 2 corresponds to mother cells (with one birth scar and one bud scar), etc. As the proportion of cells with more than four scars did not exceed 6% of the total (Figure S1), we pooled them into one group (≥5) and analyzed it as a single aging class. We found that in case of heat shock the dead/alive cell ratios for different aging classes were statistically different (Figure 1A). The same results were obtained for hyperosmotic (Figure 1A) and acidic stresses (Figure S2). However, in the case of oxidative stress (menadione) and for stresses induced by high concentrations of ethanol or butanol, there were no statistically significant differences (Figure S2). TABLE 1. Types of stresses used in this study. Virgin daughter cells have some unique properties. In particular, daughter cells have increased duration of G1 phase of cell cycle compared to mother cells  and demonstrate significantly lower resistances to acetic acid stress and heat shock . Therefore, we excluded the daughter cells (age = 1) from the calculations and performed the statistical Kruskal–Wallis test for the mother cells only. It was found that for heat shock and hyperosmotic stress the p value is below 0.01 (Figure 1A), whereas for acetic acid stress the p value was 0.29 (Figure S2). FIGURE 1: Stress resistances and regrowth of yeast cells depend on their replicative age. (A) The data are presented as percentages of dead cells in a particular aging class divided by the average percentages of dead cells in this experiment. Values higher than one show that the percentage of dead cell in this aging class is above average, and values below one represent the relatively resistant aging classes. p < 0.01 for all treatments, Kruskal-Wallis test. (B, C) Microscopy and quantification of regrowth. In C the exact numbers of cells analyzed are shown in each column. Bar = 5 μm. Obviously the ability to extrude propidium iodide is not the only criterion of stress resistance. Another is the ability to start growing after the return to stress-free conditions. Thus, we decided to test whether this ability depends on replicative age. To do that, we synchronized yeast cells with nocodazole and stained the cell walls with FITC-ConA (Concanavalin A labeled with green fluorescent dye). FITC-ConA irreversibly binds to the cell thus allowing to distinguish between the old cells (stained) and the newly emerged (unstained ones). Then the cells were subjected to a mild stress: +42°C for 30 minutes. After removal of the stress, we incubated the cells at 30°C for 90 minutes, stained them with calcofluor white to visualize ages, and measured the sizes of the newly formed (FITC-ConA free) buds (Figure 1B). 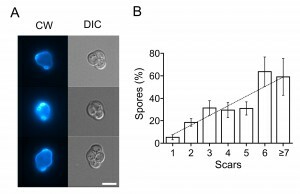 It appeared that cells with two scars have larger buds compared to the other age classes (Figure 1C). Together these data support the idea that the stress resistances of yeast cells which represent the major part of the population (ages 1-5) vary depending on their replicative age. What determines these early age-dependent changes in the stress resistances? It is known that mitochondrial morphology of the mother cells starts to change already after five or six cell cycles . Thus, we decided to look in more detail at age-dependent changes in mitochondria. We used yeast cells expressing mitochondria-targeted GFP  and stained them with tetramethylrhodamine (TMR). TMR is a lipophilic cation that accumulates in mitochondria depending on their ΔΨ. We noticed that the mother cells have much higher levels of heterogeneity within a cell than the daughters and that the level of heterogeneity positively correlates with replicative age (Figures 2 A, B). (A) Mitochondrial heterogeneity within a cell increases with age. Representative images of cells with uniform and heterogeneous subpopulations of mitochondria. Cells expressing mitochondrial GFP (mitoGFP) were stained with tetramethylrhodamine (TMR) and calcofluor white (CW). Bar = 5 μm. (B) Quantification of the results from (A). 114 cells were analyzed from 3 independent experiments. The difference between actual and expected (average proportion of cells with heterogeneous potential among the whole population) values is significant according to the chi-squared test (p < 0.05). Positive correlation is also significant according to Kendall’s (p-value = 0.05, tau = 0.8) and Spearman’s (p-value = 0.037, rho = 0.9) tests. (C) Knockouts of retrograde signaling genes decrease the survival of yeast cells with replicative ages above four. Cell were subjected to heat shock and then stained with propidium iodide (PI) and calcofluor white (see Materials and methods). The scars were calculated for each individual cell. The percentage of PI-positive (dead) cells was plotted as a function of replicative age (numbers of scars). * indicates p < 0.05 when compared to wt, Wilcoxon test. (D) Preconditioning decreases the difference in heat shock resistance between daughter cells and young mother cells. Yeast cells were incubated for 30 min at 37°C and then stressed with heat shock (47°C). Then the cells were stained with propidium iodide (PI) and calcofluor white (see Materials and methods). The percentages of PI-positive (dead) cells were plotted as a function of replicative age (numbers of scars). * indicates p < 0.01, # indicates p = 0.057. What are the possible links between the mitochondrial heterogeneity and the stress resistances? Malfunctioning mitochondria in yeast induce specific transcriptional changes in the nuclei that act to normalize the mitochondrial activities. Therefore, our finding that aging yeast cells contain heterogeneous mitochondria (meaning that some of them might be not in optimal conditions) may reflect the fact that this signaling pathway in such cells is compromised. The mitochondria-to-nucleus signaling is driven by transcription factors of the retrograde pathway: RTG1, RTG2, and RTG3 . We found that the deletion of rtg1 or rtg3 affects old cells but not the young ones when subjected to severe heat stress (30 minutes at 47°C, Figure 2C). This indicates that cells with replicative age higher than four are more reliant on retrograde signaling. We also compared the effects of preconditioning on the stress responses of cells of different ages. 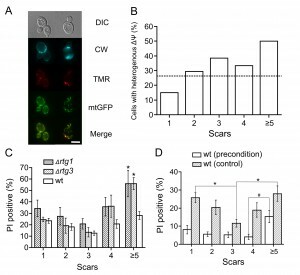 It appeared that the preconditioning increased survival of the young cells to such an extent, that proportion of PI-positive cells became similar between the cells with 1 to 4 scars (Figure 2D). The viability of the preconditioned cells with ≥5 scars also seemed to be higher than in control. However, the proportion of PI-positive cells of this aging class appeared to be different from the one for younger ages (Figure 2D). This supports the idea that in the old cells the ability to adapt to a changing environment is diminished. Does this mean that the mitochondrial heterogeneity is a sign of a general decline of the cell? Recently we showed that differentiation of yeast cells requires two subpopulations of mitochondria . This result implies that the ability of cells to differentiate in response to environmental signals increases with replicative age. To test this, we induced meiosis in diploid cells by plating them on solid medium containing 2% potassium acetate. As predicted, it appeared that the ability of cells to form spores positively correlates with age (Figure 3); at the same time, the diploid cells show similar stress resistance profile as haploids cell (Figure S3). It should be noted, however, that the latter effect could be due to correlation of sporulation efficiency and cell size , which also strongly correlates with cell age (Figure S4). FIGURE 3: Sporulation ability is positively correlated with the number of completed cell cycles. (A) Representative images of yeast tetrads stained with calcofluor white (CW) and visualized under differential interference contrast (DIC). Bar = 5 μm. (B) Quantification of results. 1183 cells analyzed from 8 separate experiments. Kendall's tau = 0.54, Spearman's rho = 0.65, p < 0.001 both tests. Our data suggest that the response to environmental challenges of yeast starts to change early during their replicative aging. In particular, these changes lead to a decreased resistance to certain stresses of the cells with 4-5 scars. This implies that under natural (as opposed to laboratory) conditions the cells are unlikely to reach replicative age of twenty or thirty. Does this mean that most of the works on yeast replicative aging (which were conducted under laboratory conditions) were studying laboratory artifacts? It was found that similar groups of genes regulate replicative lifespan in yeast and longevity in worms and mice (histone deacetylases, antioxidant enzymes, etc., see for review ). At the same time, similarly to yeast, functional decline of humans also starts at relatively early age. For example, a decrease in the number of immune T-cells in humans starts at the age of 15 years . Therefore, our data suggest that yeast can serve as a model to study not only lifespan-regulating mechanisms, but also the mechanisms of early age-associated functional decline. Interestingly, fission yeast display similar aging phenotype. Recently, it was reported that while S. pombe does not seem to age replicatively under standard laboratory conditions, stresses force them to do so . Our data also show that not all stress resistances show sharp age-dependence. Moreover, the ability for spore formation seems to increase during early aging. In other words, early aging in yeast displays features of both regular aging and differentiation. At the same time, it is well known that heterogeneity of individual cells in clonal microbial populations helps them to survive in randomly changing environment. For instance, a small fraction of bacterial cells (persisters) show slower growth rate and, at the same time, increased antibiotic resistance . Early age-dependent differentiation of yeast cells has also been already reported. In the stationary phase of growth, S. cerevisiae forms two types of cells: quiescent and nonquiescent , . Quiescent cells are represented mainly by virgin daughters; they are arrested in the G1 phase of the cell cycle and have a higher chance to survive in the stationary phase. The nonquiescent cells are continuing to proliferate. Our data suggest that such differentiation is more complex than simply mother-daughter differences. Possibly, there is a distinct number (higher than two) of aging classes of cells, with each class showing a unique set of resistances to harsh conditions. In this study, we used strains of W303 genetic background strain (Table 2). If not indicated, exponentially growing yeast cells were prepared as following: prior to the treatments the cells were grown overnight at 30°C on solid YPD medium prepared according to  and transferred in liquid YPD for 3.5-4 hours until the optical density (OD550) of the suspension reached 0.2 (4 x 106 cells per ml). TABLE 2. Yeast strains used in this study. 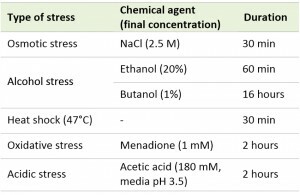 Cell suspensions in liquid YPD were subjected to various types of stresses: 2.5 M NaCl for 30 minutes, 20% ethanol for 1 hour, 1% butanol for 16 hours, heat shock (47°C) for 30 minutes, 1 mM menadione for 2 hours, or 180 mM acetic acid (pH of the medium was set to 3.5) for 2 hours. The types of stresses used in this study are summarized in Table 1. Incubation of the cells for 30 minutes at 37°C was used as preconditioning for heat shock. Sporulation of diploid W303 cells was induced on solid potassium acetate-containing medium (2% potassium acetate, 2% agar) for 3 days. The cells were synchronized with nocodazole (10 μg/ml), washed 4 times with YP, then moved to YPD containing FITC-conjugated Concanavalin A (FITC-ConA) and incubated at 30°C for 10 minutes and then at 42°C for 30 minutes. Then the cells were washed 2 times with YPD and incubated at 30°C in YPD for 90 minutes. After 90 minutes, the cells were transferred to YP media containing calcofluor white, as described in the Microscopy section. After the stresses the cells were washed with YP containing Propidium Iodide (PI, 1 µg/ml) and calcofluor white (CW, 5 µM). PI-positive cells were counted as dead. Calcofluor white was used to visualize scars on the cell surface (birth scar and bud scars) for replicative age measurements. Cell viability, replicative age, and percent of spores were determined manually using an Olympus BX51 microscope. Photographs were taken with a DP30BW CCD camera. Cell size was measured manually using the ImageJ program. All data are presented as average and standard error. Wilcoxon signed ranked unpaired test and Kruskal-Wallis test were used to compare datasets from different strains or conditions with the R software package. All viability experiments were performed independently 4 times, and each time at least 90 cells were analyzed unless indicated otherwise. When the proportions of the PI-positive cells were low, we counted the age distribution of PI-positive cells only and then extrapolated the result using the average survival in this experiment. We are very grateful to Svyatoslav Sokolov, Vitaly Kushnirov, Boris Feniouk, and Peter Kamenski for a valuable discussion of our work. This work was supported by the Russian Foundation for Basic Research grant 12-04-01412-а. Early manifestations of replicative aging in the yeast Saccharomyces cerevisiae. by Maksim I. Sorokin et al. is licensed under a Creative Commons Attribution-NonCommercial-ShareAlike 4.0 International License.